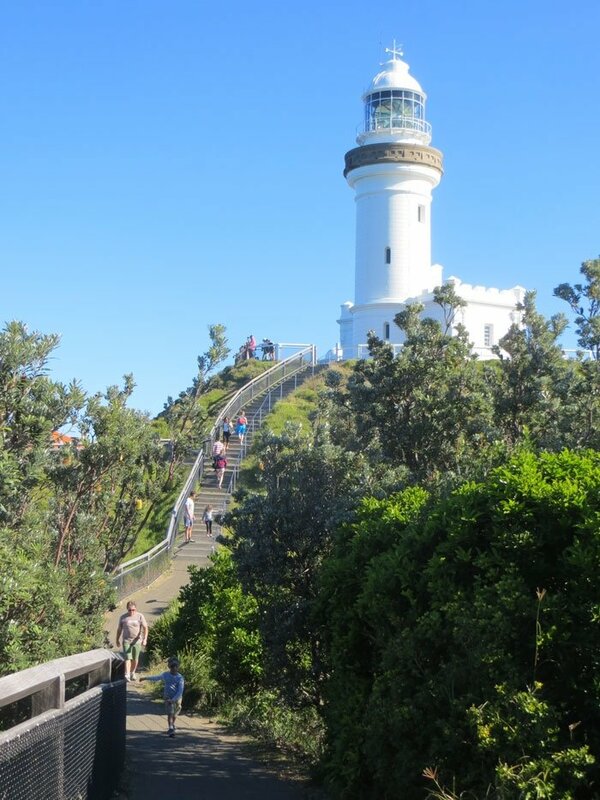 With almost half a million visitors a year, it’s fair to say that Cape Byron Lighthouse is Byron’s most popular tourist attraction. A visit gets you two attractions for the price of one. Not just the lighthouse, but the second is the furthest easterly point of the Australian mainland. You can cheat and just drive up there (boo! ), but if you want to get the best experience take the 1.5km walk from the northern side of the cape. 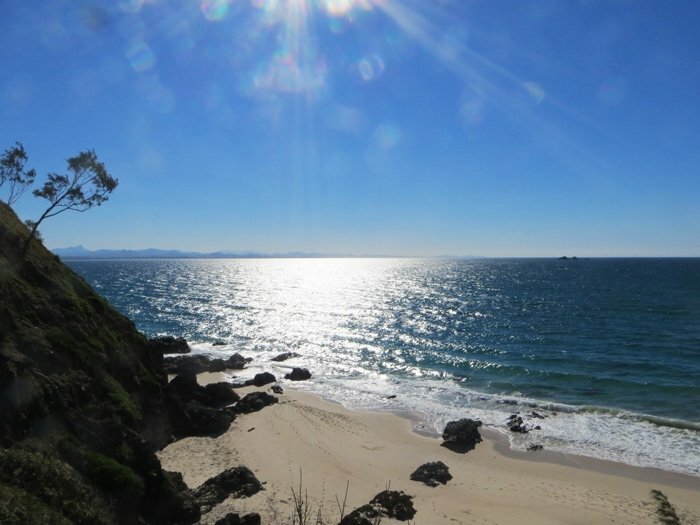 Starting at sea level you will pass along the southern end of Byron’s iconic Main Beach. There’s a great little elevated walkway here that can take you over the rocks to explore the edge of the ocean in comfort and style. Next you will head into protected rainforest over the hill and find yourself on the smaller and more protected Wategos beach. This is actually a great spot for a barbecue, with plenty of clean public cooking facilities in a shady spot just above the sand. But It’s only been a 10 minute walk to this part, so perhaps on the way back is best. After Wategos the real hike begins. Back into the protected rain forrest, the elevation quickly rises. There are plenty of steps which will make it very difficult if you have a stroller or likely impossible in a wheelchair (you’ll can still go, but via the main road instead). 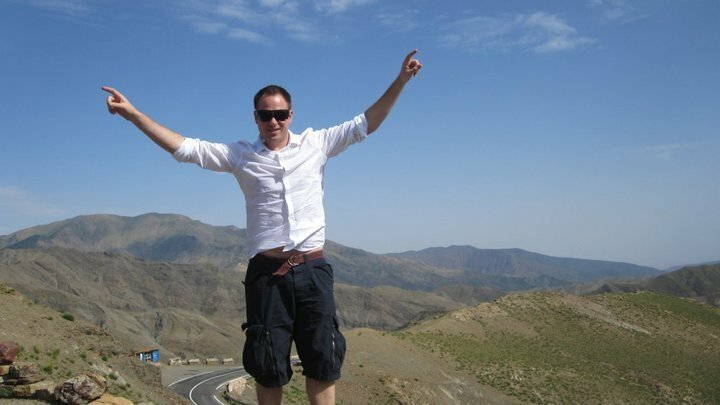 The good thing about rising so high so quickly is that you don’t have to wait long to get the great views. Here is one looking back at Byron and the hinterland that hugs it from behind. 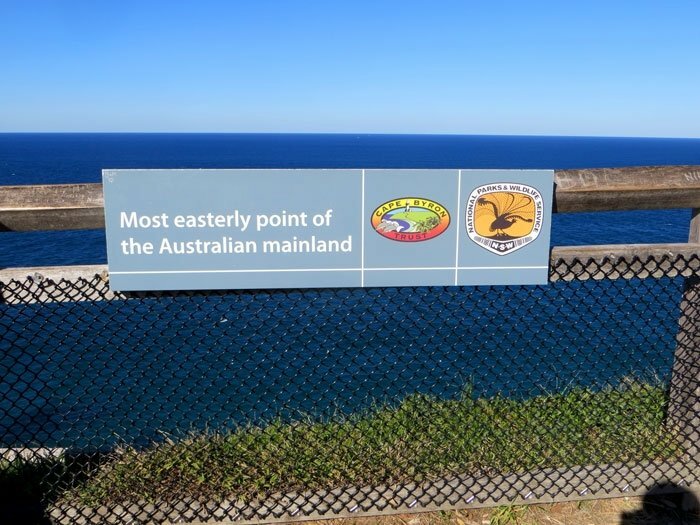 It’s a quick walk further out into the ocean and you are at Australia’s most easterly point. 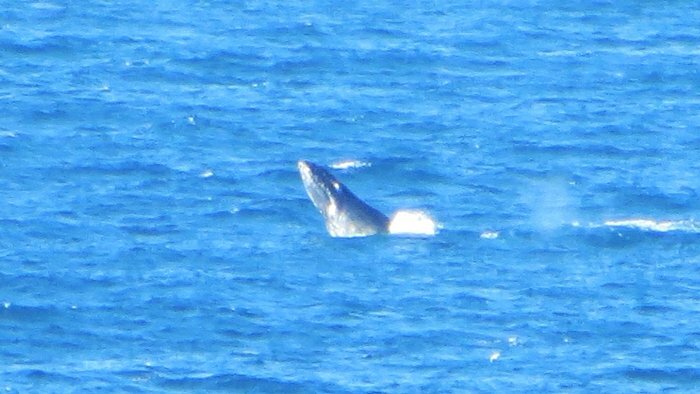 It was here that I first noticed whales playing and splashing about offshore. 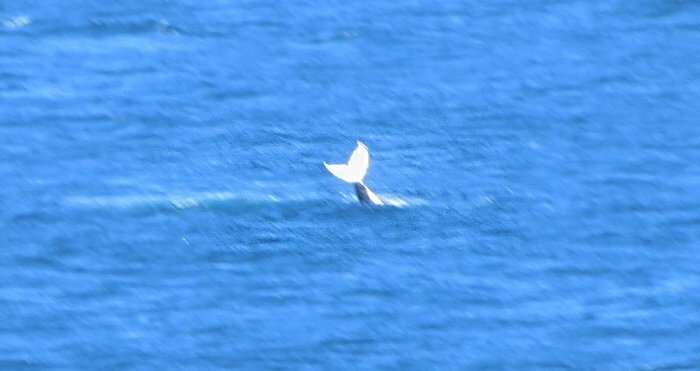 The easterly point is great for taking photos of whales, as you are sticking the furthest out into the ocean, so there is no land to get in the way of your pictures and you’re also as far out into the ocean as you can get from land. Another reason why it’s great is there is plenty of seating and lookouts to get a great vantage point from. The end is now in sight, just up a final set of stairs and I’ve made it to the top of the cape and the the foot of the lighthouse. 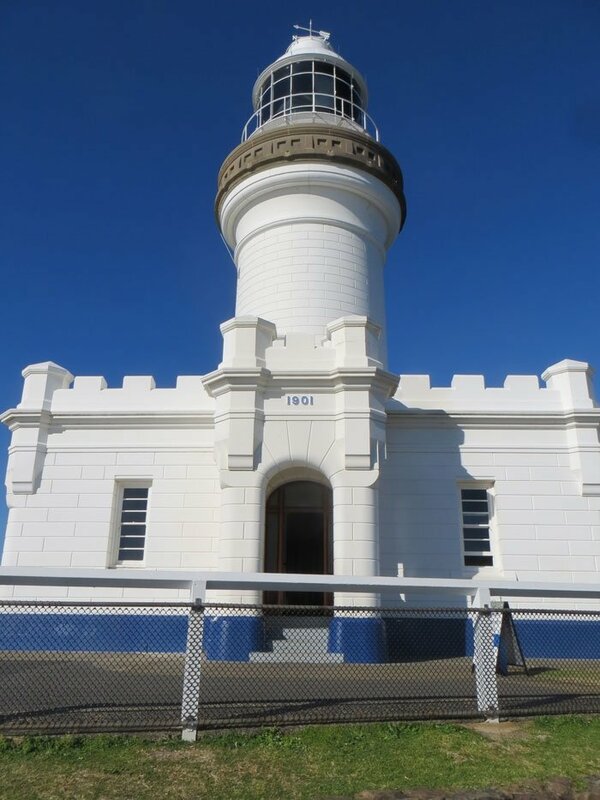 I’ve seen plenty lighthouses on this trip, but Cape Byron Lighthouse is perhaps the grandest. Inside you will find a small but informative museum and next door a cafe to replenish yourself after climbing up the headland. So where is Australia’s largest collection of Whisky? You’d expect it to be in the current uber hot small bar scene in Sydney and Melbourne. Places like Baxter’s Inn and The Barber Shop in Sydney or Whisky and Alement in Melbourne are formidable, but pale in comparison compared The Roadhouse. 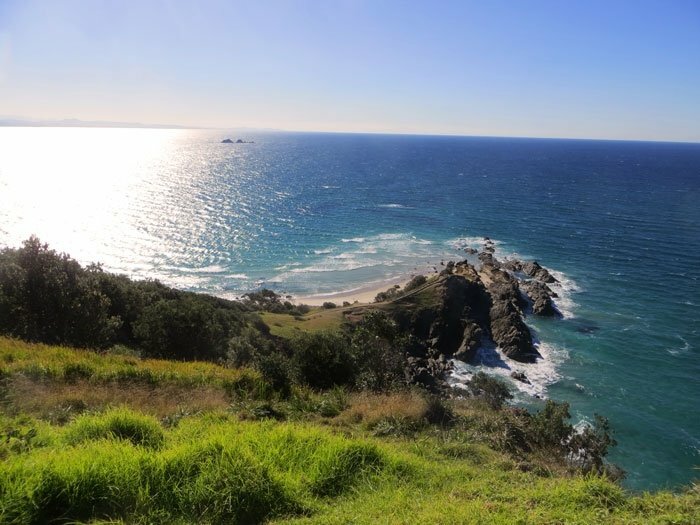 What is even more striking about this place – it’s almost 2km out from the bars, pubs and restaurants of central Byron Bay. Instead, The Roadhouse is located on suburban Bangalow Road – conveniently about 50m from by bed at Byron Springs. I came for the food but I stayed for the Whiskey. 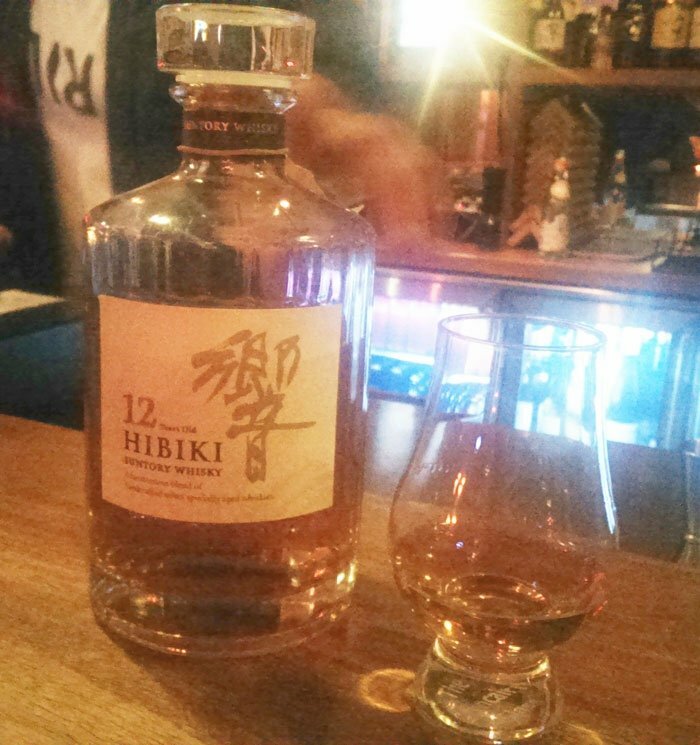 Pull up a stool and ask the bar man what you’re after and you’ll get an enthusiastic reply, a serve of a type of whiskey you’ve likely never heard of, it’s life story and a complimentary smile. I promised myself only to just try one, but I ended up on three. Leaving with two new great mates (the barman and the guy next to me) and a newfound interest in whisky that I can’t wait to continue once back home.. Whiskey #1. 12 year old from Japan. Taste matched exactly what I told the barman I was after. 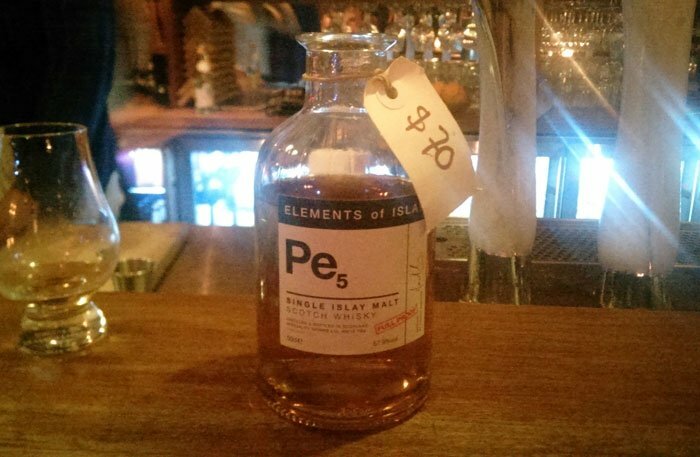 A very rare Elements of Islay Pe5. The Distillery closed and reopened while this was being distilled. That $70 is not for the bottle it’s for a serving. I stumbled home just before closing time. But that wouldn’t be it for The Roadhouse for me. They are open at 7am with some of the best coffee in Byron, and I was there the following morning to get caffeined up before the next chapter of my Australian east coast road trip. I had originally planned to drive out to Nimbin this day (Australia’s hippy homeland, where dope buying and smoking is apparently tolerated). But I was talked out to it buy super-host Susie of Byron Springs. 20 minutes into the drive I’m glad I took Susie’s advice. 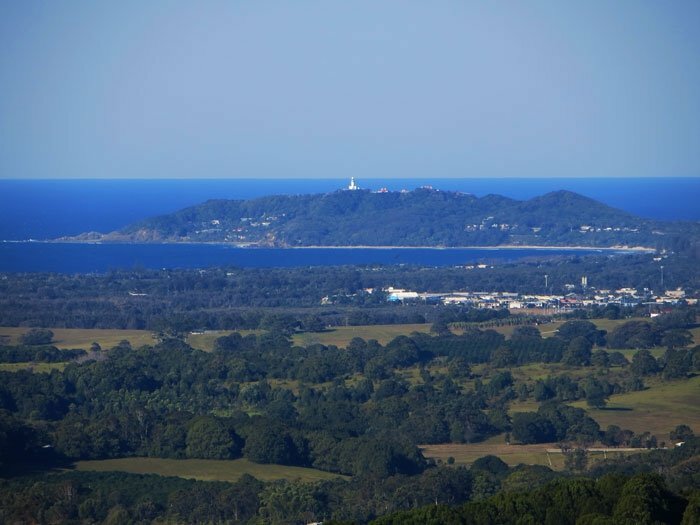 Susie instead suggested I follow the mountain ridge-line behind to the quaint town of Bangalow, check out the sweeping views and enjoyable mountain roads before coming back down to sea level at Mullumbimby and the finishing at the riverside town of Brunswick Heads. Bangalow is actually only an enjoyable 20 minute drive from Byron Bay. You drive along sweeping country roads up hill through rain forrest and bright green farmland, I almost wanted the drive to keep going as I turned the corner and entered the historic main street. It has everything you would expect from Australian country town main street. A pub, and few cafes and town hall. This town has been “Byronified” though, meaning it’s artistically decorated (the mural to person ratio must be the highest in the country), the pub is gastro and the cafes gourmet. Example – I ordered a hotdog for lunch. What do I get? locally produced sliced chorizo, with roasted bell peppers and a very tangy chiptole sauce. That kind of sophistication is unlikely to be found in other towns of this population. Bangalow Hot Dog.. much tastier than the traditional kind. The glorious driving continued outside of Bangalow. I took the Coolamon Scenic Drive towards Mullumbimby which goes past the tourist attraction Crystal Castle. On the way there is a unsigned lookout. It will be hard not to miss because the view below will smack you in the face as you drive past. There’s a picnic table and chairs there and if I knew what I was doing I would’ve got takeaway lunch from Bangalow and eaten here – learn from my mistakes. Mullumbumi, soon came into view while cruising back down the Mountain Range. 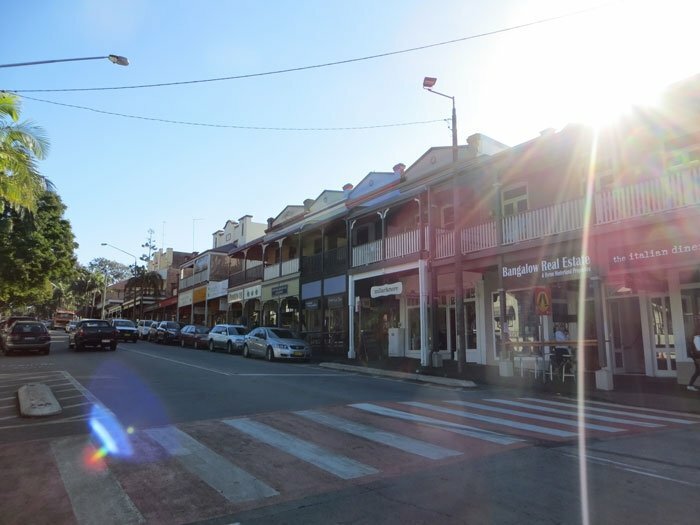 This town feels like a less commercialised version of Byron Bay and the charming main street you can find all types of alternative art and produce, such as an old official building that is now a large vegetarian store. The main industry here appears to be relaxation, with a wide range of day spas to choose from. You can see why, the flat town is surrounded by tall uniquely shaped mountains that just make it a beautiful place to be. The sun was getting low and I really wanted to get cracking to my next destination before it set. 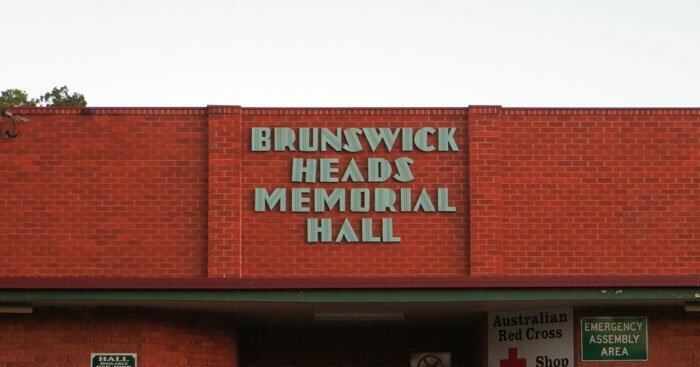 Susie told me that Brunswick Heads was a stunningly beautiful river town and I sure as hell didn’t want to see it in the dark. The first thing you notice about Brunswick Heads is the two old wooden bridges that separate the town from the coast. Cross the northernmost bridge and you will end up at a small breakwater protecting a harbour on one side and some wild surf on the other. This day had strong offshore winds forming some of the most perfect waves for surfing I’ve ever seen. A dozen surfers were out there making the most of it. 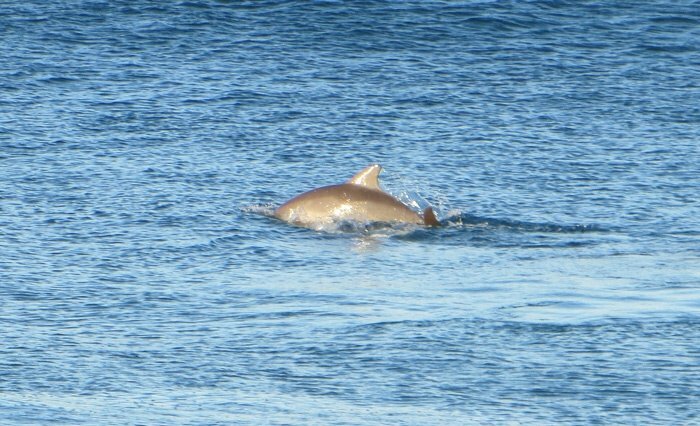 Also joining in were 4 or 5 dolphins. With surf that good who can blame them? 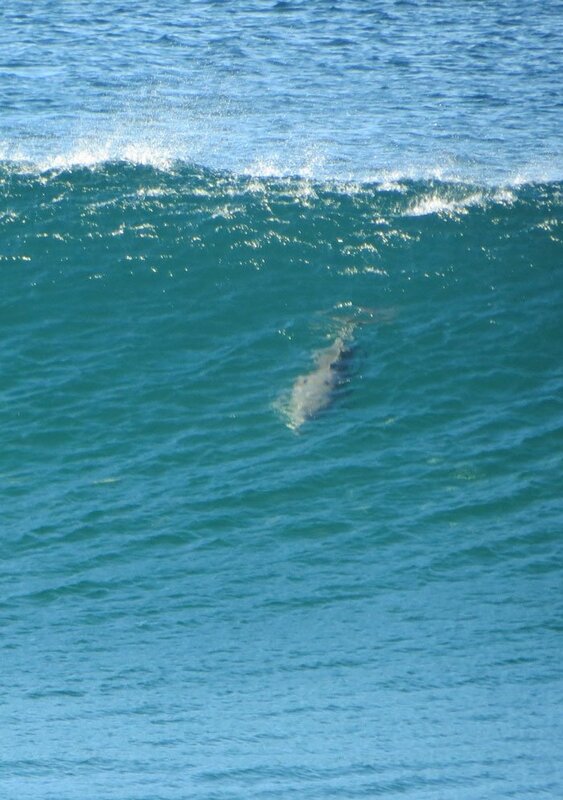 I was lucky enough to get a couple of pics of them riding the waves below. With the sun setting and the show coming to an end. It was time to see what else this place has going for it. First Stop – Hotel Brunswick. This majestic old queen is very imposing with it’s symmetrical art-deco design. Unlike many early Australian pubs which are mostly indoor and not conducive to outside drinking. The Brunswick Heads hotel instead has a very large beer garden out the front. 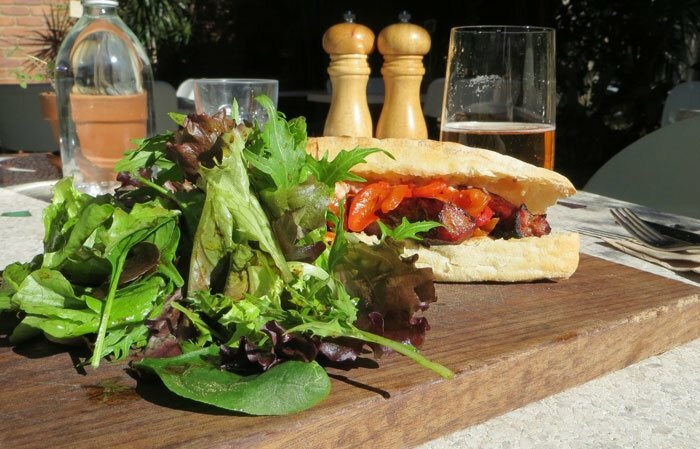 Getting the north facing sun, it must be in contention for the best beer gardens in NSW. A quick (light) beer to savour the moment and it’s back to Byron Springs for dinner and another nightcap at The Roadhouse. Truth be known I had actually spent an extra day on Byron, and now I had to leg it back to Sydney. It wouldn’t be the leisurely drive I had planned but I still hoped to get off the highway as much as possible and see what was there. I had always known about Ballina growing up, but what I didn’t know was how historic the town was. Built in the 1840’s as a river port on the Richmond River, much of the town still maintains it’s buildings form that time. These day’s it’s very much a coastal community and increasingly large shopping centres and strip malls are becoming the focus. One fellow who has remained since 1989 is the Big Prawn. However he now has a new home in front of Bunnings, who saved it after the petrol station he was originally at got knocked down to make way for their hardware warehouse. 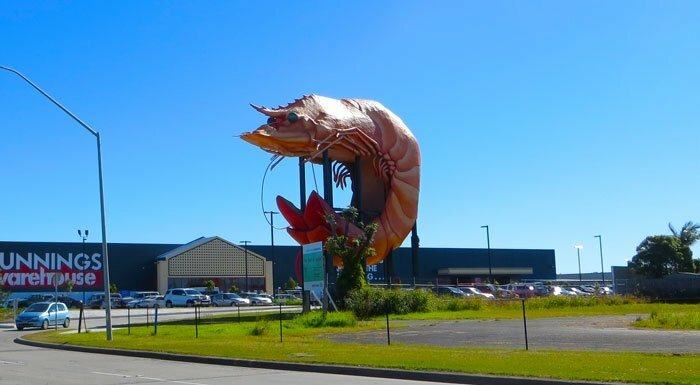 Ballina’s Big Prawn. One of many Australia’s big things. Flying down the Pacific Highway, I still wanted to check out another oceanside location before darkness set in. Enter Nambucca Heads. This charming seaside town also has a river inlet and it’s only 2 or 3km off the Pacific Highway so taking a diversion to see it won’t hold you up too much. I cruised down into the inner harbour to take a breath and experience the serenity when out of nowhere about 20 pelicans come flying down, gliding across the water and right up to me. They either were giving me a great welcome or thought I had food (most likely the latter). I had to sleep somewhere and Forster seemed as good as place as any. I used good old hotelscombined.com to find me the cheapest (reasonable) place to stay, and I came up with the below. 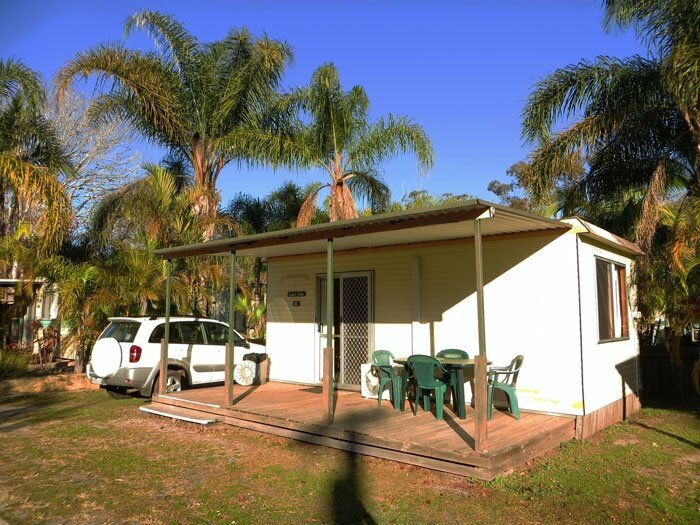 A four person cabin in a caravan park for the grand total of $50. That’s like hostel prices!. The cabin, while basic, was charming, included kitchenette, satellite TV and reverse cycle air conditioning. The heat cycle was required that night as the mercury slipped to 2 deg. Forster is famous for it’s long bridge connecting it to sister city Tuncurry, What it’s not famous for is food and I tolerated one of the worst Mexican meals I’ve ever had. But at least there was a decent band to make up for it. 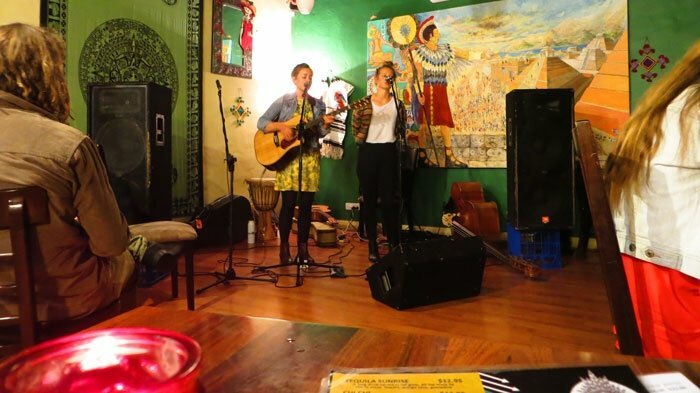 Chilled out band and a salty limey beer, what else do you need? An early start in the morning and my GPS took a via The Lakes Way. If you love to drive, this is the way you have to go in and out of Forster, a 30km winding stretch of road that passes by oceanfront, lakefront and mountainside. You won’t get where you’re going as fast, but you will arrive in better spirits as the road is a joy to drive compared to the straight and wide Pacific Highway. The perfect drive to end the perfect road trip. 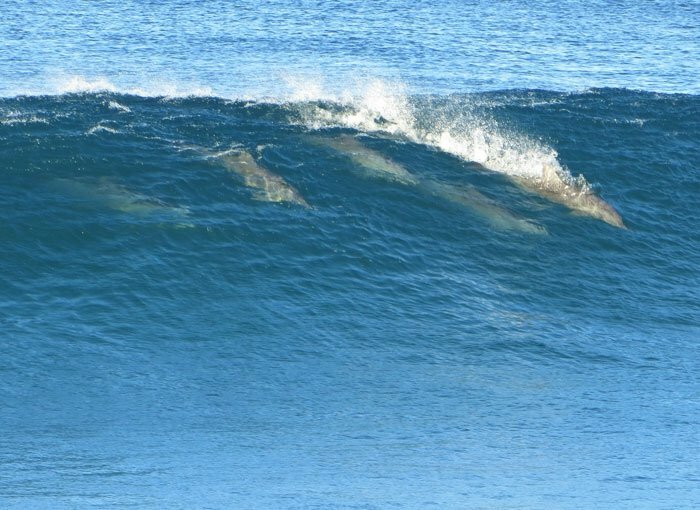 This entry was posted in Oceania, Travel and tagged Australia, byron bay, dolphins, NSW, road trip, surfing, travel, whiskey, whisky. Bookmark the permalink.